When you think of a bar of soap, you probably picture a slimy, lumpy hunk of plain white soap that’s slowly melting in your shower. It’s little wonder that so many people have begun to prefer liquid soaps and body washes. After all, they come in so many scents and an infinite variety of formulas. They store away neatly in their bottles, and you never have to worry about them slipping out of your hands. But the bar soap industry has been making some impressive changes in recent years, and its high time we revisit our first impressions and give the new bar soaps another chance. These newer soaps are often just as luxurious (if not more so) than their liquid counterparts, and people everywhere – both men and women – are clamoring to get their hands on them. If you’re still skeptical that anything can beat your trusty liquid body wash, keep reading. In this guide, we’ve compiled everything you need to know about all the new types of bar soap on the market so that you’ll be sure to find one that is right for you. So, what makes these new bar soaps better than your favorite liquid body washes and scrubs? 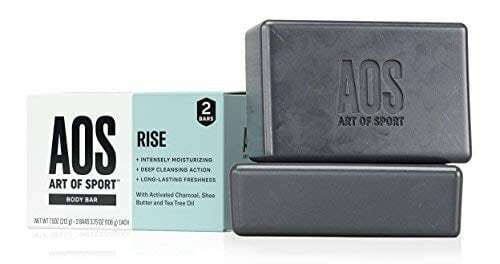 When you travel with a bar of soap in your hygiene kit, you never have to worry about it accidentally coming open and leaking in your bag, which makes it perfect for showers after a workout at the gym or while you’re on vacation. Speaking of vacations, you also never have to worry about bar soaps making it through airport security – and we can’t say the same for liquid soaps and shampoos. And of course, there’s all the bag space you save when packing soap bars instead of bottles. You can cut down on your carry-on weight and help save the environment, all in one fell swoop. Many bar soaps these days are also multipurpose washes. For example, you can easily find bar soaps that also double as shampoo. In fact, some of the best shampoos for beards come in bar form, similar to the top rated beard soaps. There are also even bars of conditioner, which are sometimes combined with shampoos and sometimes sold on their own, as is the case with many natural beard conditioners. The dual-purpose nature of these newer bar soaps will not only save you space by cutting down on the clutter of bottles in your bathroom, but they can also save you money. 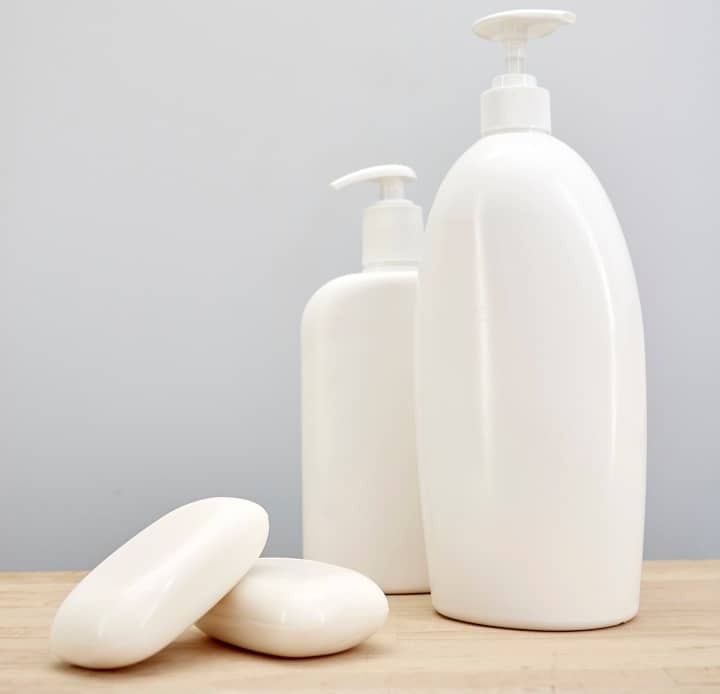 Bar soaps can be thought of as a more concentrated version of liquid soap. With bars, you get more soap for your dollar, and it lasts much longer when stored properly. Before we can get into what you should look for in a bar of soap, we need to run through all the different types of soaps that you can choose from. If you thought that natural conditioners for men were a niche item, you’ll be surprised at how many types of soap there. And many of these are made using techniques that date back decades if not centuries. There are quite a few types of soap, and each is made to suit a specific purpose. Understanding how they’re made and their intended uses will help you find the soap that is best for you. Hot-pressing is an industrial manufacturing method that a lot of big brand-name soaps use. It cuts production time and costs, but it also reduces the amount of good-for-you ingredients in the bar, like glycerin and healthy oils. These soaps can sometimes be harsh on dry or sensitive skin if they don’t have an added moisturizer. On the opposite end of the spectrum, we have cold-pressed soaps. This process takes much longer than hot-pressing (anywhere from four to six weeks!) and usually leads to higher product costs. But you’re definitely getting your money’s worth – the cold press process leaves all the good essential oils in the soap intact, for which your skin will thank you. Milling is a production technique that is used to lock in moisture and ensure that ingredients are evenly mixed throughout the bar. In this process, small chips of soap are blended up into a homogeneous mixture and then compressed into a bar-shaped mound. These soaps are triple milled, leading to a greater feeling of smoothness and richness. These are made with heavy perfumes to mask unpleasant smells and antiseptics to fight off odor-causing bacteria. While they work fine for most people, the harsh chemicals can sometimes cause allergic reactions for those with sensitive skin. The strong perfumes can also attract insects, so these are not ideal to take on camping or fishing trips. Despite the name, soapless soaps are soap; they’re just made from petroleum-based materials instead of the traditional animal fats. They are far less alkaline and abrasive than most other types of soap, which makes them ideal for young children and people with extremely sensitive skin. Glycerin is a type of fat that is good for your skin and can be a great moisturizer. Soaps with a high glycerin content do wonders for cracked or dry skin and are ideal if you spend a lot of time outdoors in the elements. 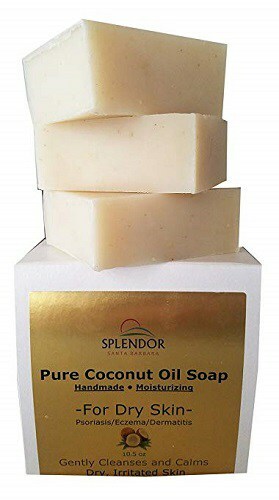 Like glycerin soaps, superfatted soaps contain extra moisturizers like mineral oil, avocado extracts, and cocoa butter. A normal bar of soap generally has less than two percent oils/fats, but the average superfatted soap has between ten and fifteen percent. They are great for people with dry or sensitive skin and are often recommended for those with conditions like eczema. A subcategory of superfatted soaps that have a very high glycerol content. They tend to be very soft (and obviously, transparent). As the name suggests, these soaps contain exfoliants – tiny abrasive particles that are used to remove the dead outer layers of skin. They can help leave your skin with a fresh glow and are also good in treating acne – both on the face and body – but they can cause issues for those with very sensitive skin. 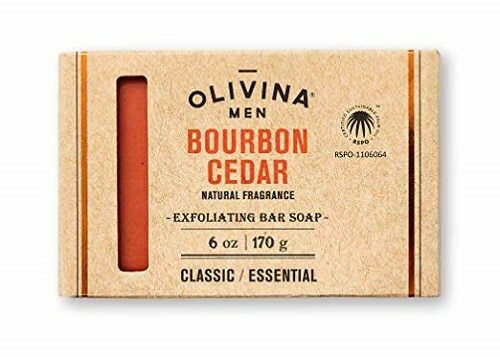 Maybe not a soap in the traditional sense, but these bars are just a more concentrated form of the normal liquid shampoo you’re used to, with all the portability and convenience of a bar of soap. You can also buy bars of conditioner to match. They’re great for traveling and camping. 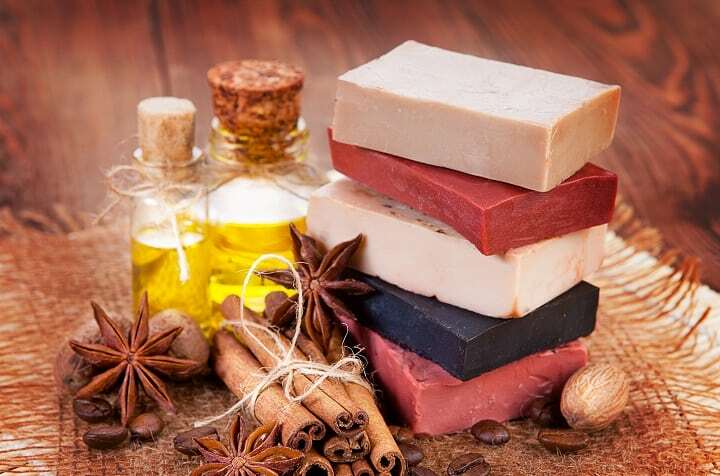 What Ingredients Should the Best Soap Bar Have? Just like with packaged foods, you never really know what you’re going to get from your soap until you read the label. It’s important to know what you’re putting on your body – and you should be picky, giving potential soaps just as much scrutiny as you would high-quality beard balms. This simple fat molecule is the key to a good, nourishing soap. It helps to hydrate and protect your skin, but it is often removed from mass-produced soaps because it can lead to a softer bar. If you’re a hard-core vegan or have a glycerin allergy, look for soaps that use petroleum-based fats instead (often called soapless soaps). No matter how far science advances, you really just can’t beat the health benefits of nature’s bounty. 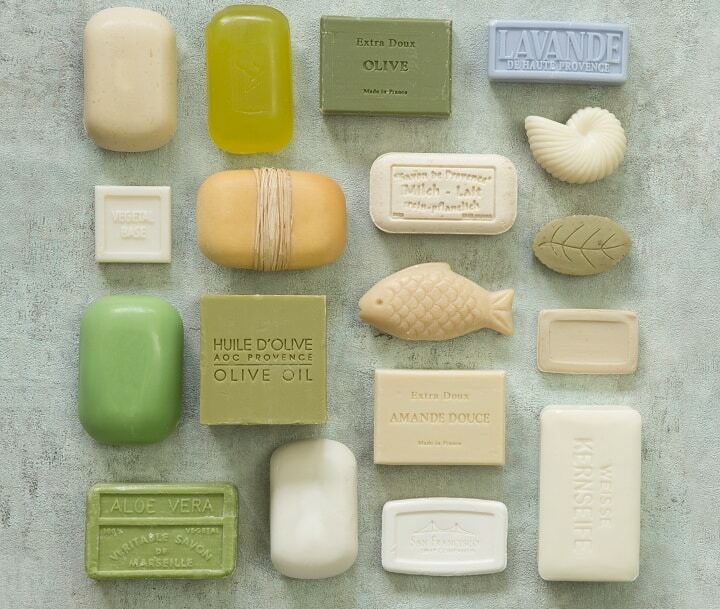 When it comes to moisturizing ingredients – which you definitely need in any soap – natural is best. Some of the most popular are olive oil, argan oil, mineral oils, lanolin, avocado oil/extracts, and cocoa butter. As far as cleaners go, you want to avoid harsh chemicals or synthetics whenever possible. A great alternative is lauroyl isethionate, which is derived from coconuts. It is fairly mild and safe for most skin types. There are ingredients you should insist on, and then of course, there are those you should avoid. We’re going to go over a few of the most common ingredients that you should try to steer clear of, but if you have allergies or sensitive skin, the list will be longer. It’s the same with foods – you want to make sure that what you’re putting in and on your body is as natural as possible. 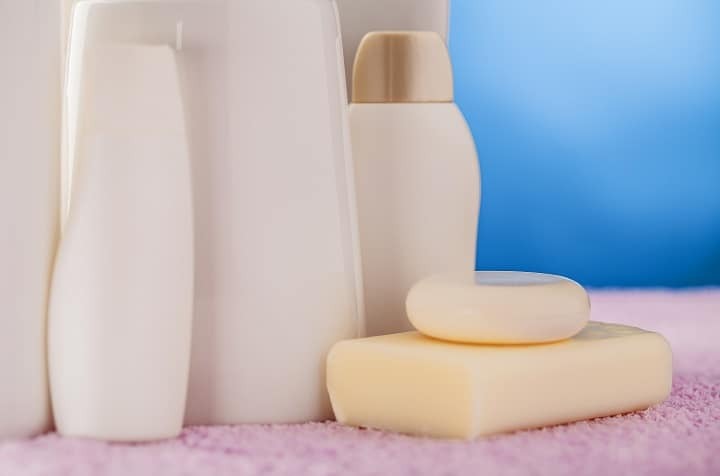 In the case of soaps, preservatives are often added to help the bars last longer, but they can often cause soaps to leave more residue on your skin and can cause irritations if you have sensitive skin. A lot of the added fragrances (also sometimes called “parfum”) are harsh synthetics that can cause skin irritation. 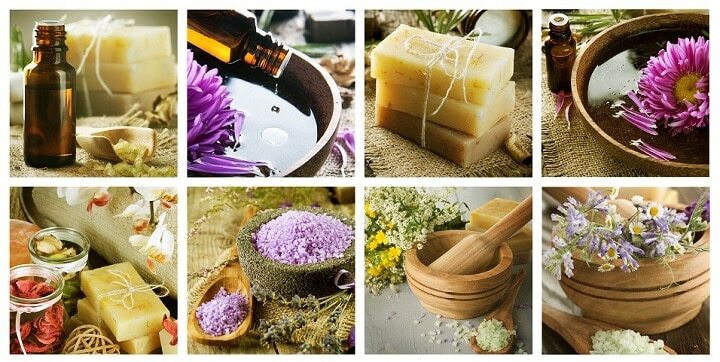 Instead, try to use naturally scented soaps that use flower or herb extracts. What Features Should the Best Bar Soaps Have? We’ve talked a lot about different types of soap, but you’re not likely to walk down the soap aisle at the grocery store and see all the products arranged under those labels. It can help to know exactly which features you should look for in a good bar of soap. You could just buy any old bar of soap, but you’re a discerning man who takes pride in his appearance – you only buy the best beard oils and balms. The very best soaps boast a rich, thick lather – and the ones that bar soaps offer is frankly unparalleled. Whether it’s a bar of body soap, shampoo, or even face wash, the greater lather offers a better and more comfortable clean. Some soaps lather up so well that they can be used to replace professional shaving cream. You want to make sure you’re using a soap that rinses off completely and leaves no residue on your skin. This is especially important if you have sensitive skin or are using a face wash bar. The best face washes give you a deep clean without leaving behind potential irritants or clogging your pores. Otherwise, it can leave you with red, bumpy, or itchy skin, as well as ingrown hairs and acne. In the same vein of reducing skin irritation, you also want to make sure you’re using a soap that won’t dry out your skin. You might be surprised to find out that some of the biggest name brands are actually the worst offenders. They tend to get a little overzealous in removing oils, which can sometimes cause mild skin irritations. Soaps are made to remove oils, but your skin does need some moisture in order to stay healthy. You want to look for soaps that aren’t harsh on your skin or those that have built-in moisturizers. This one seems like a no-brainer, but for a lot of guys, scents can often be what makes or breaks a product. Historically, most hygiene products – soaps in particular – have either been overwhelmingly feminine scented, or completely unscented. But men no longer have to choose between smelling like a Lilac Summer Night or nothing at all. With all the new soaps on the market, there are plenty of more masculine scents to choose from. Bar soap scents also tend to linger longer than those of their more dilute, liquid cousins, so they’ll leave you smelling nicer, longer. You might not want a bar of soap with a ton of bells and whistles, and that’s perfectly fine. But if you’re looking for something that will rival your liquid soaps or shampoos, you may be surprised to realize you can find what you’re looking for in a bar. There are tons of bar soaps that have extra moisturizers for rough or dry skin, or built-in exfoliants to give you a thorough clean. There are even special bar shampoos for getting rid of dandruff, which are said to be more effective than the leading liquid shampoo. 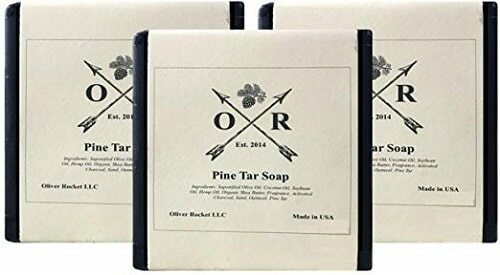 Made with various oils, charcoal and pine tar Oliver Rocket leaves your skin smooth and soft. Pine tar fragrance is pleasant, but not overpowering. It can be used as a body soap, exfoliant, face cleanser, but according to some, it can also be a great hair shampoo. It’s perfect for shaving and as a beard washing soap. It comes in a package of three bars and with a money back guarantee. Since it’s made with natural ingredients, it quickly dissolves if you keep it in a place with water puddles around it. Furthermore, because it’s made with charcoal, it leaves black spots so be sure to rinse your shower and sink properly. 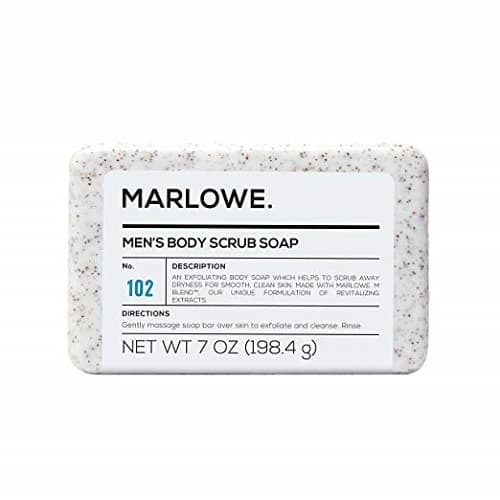 Specifically made for exfoliating, Marlowe Soap scrubs away the dirt and dry skin. For more exfoliation, you should massage the product all over the skin and for less exfoliation, leather the product in hands, than use it on your skin. The scent is light but masculine. The soap itself is paraben and phthalate-free and it’s not tested on animals. It’s glycerin based and contains green tea and passionflower fruit for smooth and revitalized skin. Depending on usage, it can last for a month or even more. In conclusion, this glycerin based soap is rougher than other similar products, but it results in soft and clean skin. 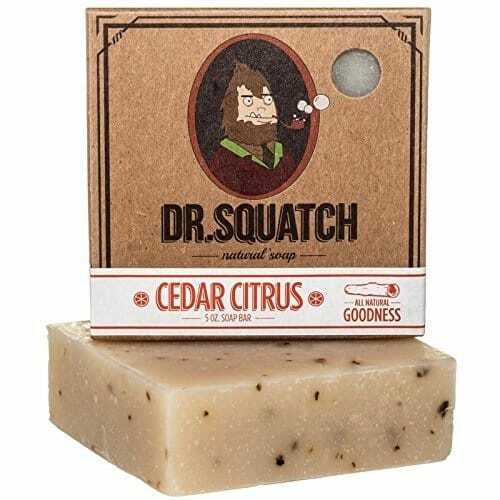 Made using a natural ingredients Dr.Squatch makes your skin clean and keeps it moisturized, without drying or irritating it. Almost everybody may benefit from this product, even those who live in climates with harsh weather. It can be used for multiple treatments like exfoliating, shaving, face and body wash and more. The exfoliant is not harsh and it lathers up well. There are even nine energizing and refreshing scents to choose from, such as pine tar, cedar citrus, deep sea goat’s milk and more. In the package, you get one 5 oz soap, which is not very long lasting. Also, it’s a bit pricey considering the amount of the product. 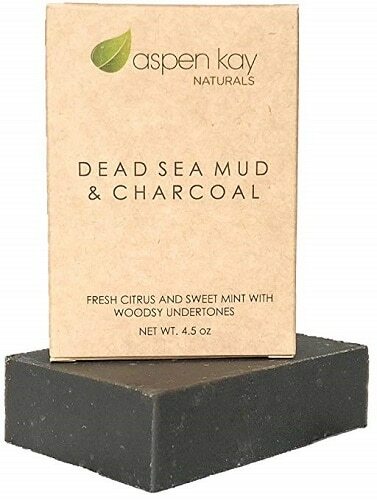 Chemical and preservative free, Aspen Kay Naturals is made with pure dead sea mineral mud and certified organic oils. It tightness the pores for an anti-aging effect, draws out impurities and toxins and the fine grains act as an exfoliator. It’s appropriate for every skin type and those fighting with eczema and psoriasis, it can be of great help. The scent is very natural and light, made with essential oils of lemongrass, peppermint and eucalyptus. To keep the soap long lasting it must be kept dry between the uses. It might cause short term breakouts, but it’s a good sign that your skin is clearing up from the build up toxins. Finally, it always useful to make a patch test before actually using the product, to make sure you are not allergic to any of the ingredients. With hydrating, rich leather Art of Sport keeps you feeling fresh all day. Made without sulfates, parabens and alcohol, it’s hypoallergenic and non-irritating for all skin types. Among its natural ingredients are activated charcoal, shea butter and tea tree oil that leave your skin feeling clean and smooth. Although it’s primarily made for athletes, it will benefit anybody, especially those who move a lot throughout the day. 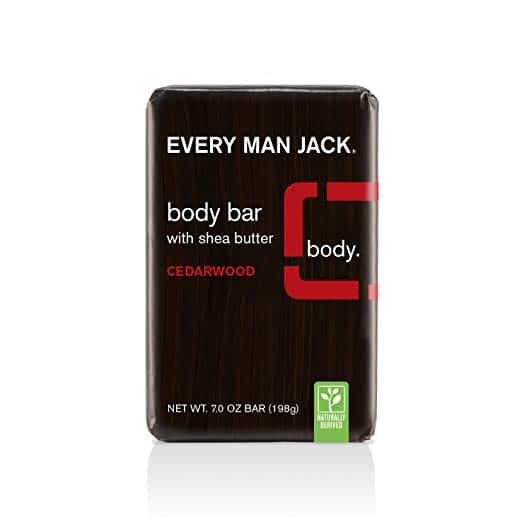 Refreshing cedar and vanilla scent stay even after a workout, without being too overpowering. The package comes with two 3.75 oz bar soaps. However, it can wear down pretty fast if it’s not stored correctly. 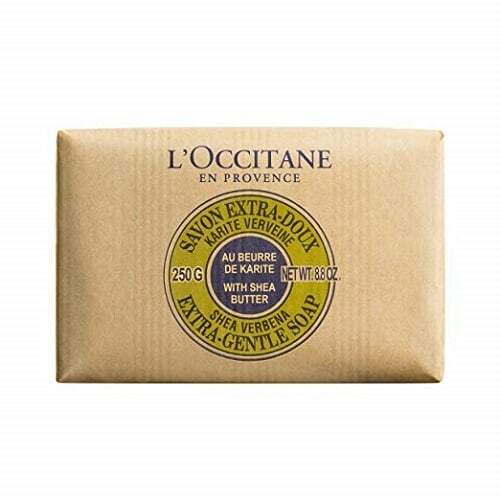 With creamy lather that gently cleans the skin, L’Occitane Soap Bar is one of the most luxurious soaps out there. Its ingredients include gentle vegetable oil base and nourishing shea butter that leave the skin feeling hydrated and soft. It can be used daily and it won’t dry out the skin. While a hint of lavender smell is noticeable, it’s very subtle and neutral and suitable for both man and woman. Even though it is high-priced, it comes in an 8.8 oz, which is twice as big as most other soap bars. Lastly, because it’s large, you should cut it into sections before you use it. Otherwise, it will be hard to handle. 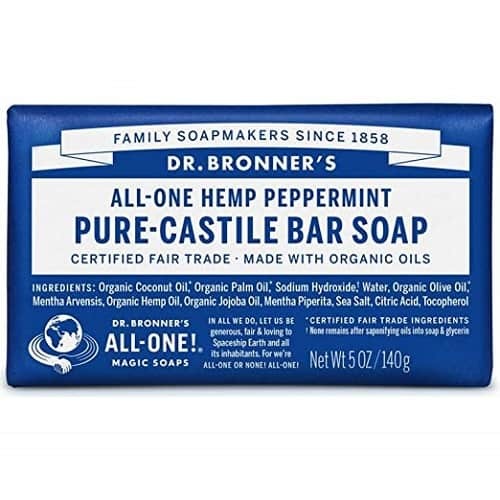 Scented with peppermint oil Dr. Bronner’s Soap Bar keeps the skin cool and refreshed. Made mostly out of organic oils this soap doesn’t contain any harmful ingredients. Besides using it for washing face, hair and body, it can also make a great homemade powdered laundry detergent. The product is 100% biodegradable and wrapped in a recycled paper. More than that, it’s made to be completely cruelty-free. Even though peppermint scent is nice and refreshing, it does wear off after a short period. As always, it’s recommended to take a patch test before using it, because it may cause breakouts and irritation for those sensitive to some of its ingredients. Inspired by the navy, Duke Cannon comes in an appealing blue color with a refreshing aquamarine, ocean scent. Shape and size resemble the brick, as this product is three times larger than usual soaps and even 10 oz in weight. It contains grains for exfoliation, for which many complained that are too big and harsh. It can as well be used as a shampoo, but make sure to rinse it thoroughly. Since it’s so large, it can last a long time, but it can be a bit difficult to use it while in one piece. 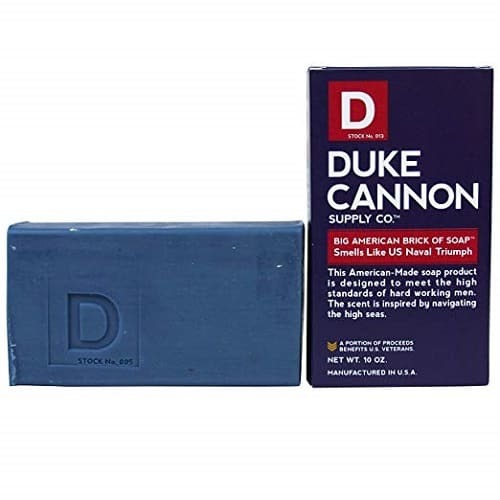 To sum up, this product is excellent for a manly man who seeks a long-lasting and refreshing soap bar that keeps him clean without the shower gel and other similar accessories. Without any harsh chemicals, Every Man Jack soothes, conditions and cleanses your skin. 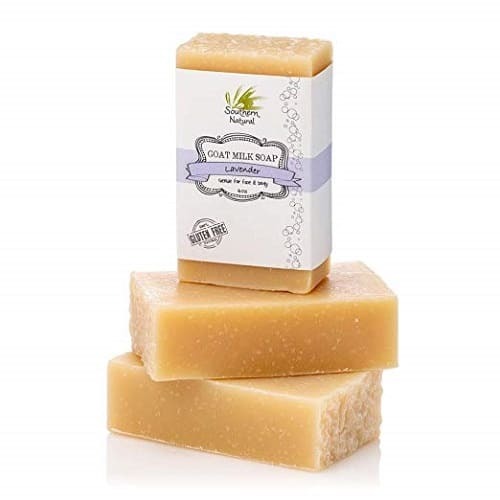 This affordable soap bar is made out of a vegetable base that cleanses, aloe and shea butter that hydrate and soothe the skin and glycerin which moisturizes it. Essential oil of cedarwood leaves a subtle and clean scent, which is not for those who are looking for a robust and striking scent. After using it for a week or so it becomes gritty and makes an excellent exfoliator. Additionally, the manufacturer made the product with a high percentage of recycled plastic and didn’t test it on animals. Although it profoundly cleans skin, some costumers complained that it left stains on their clothes, especially on a white one. To provide the ultimate deep cleaning Olivina Soap Bar is made out of red, white or green kaolin clay. Together with other organic ingredients it softens and hydrates skin, and most importantly, purifies it from build-up impurities. It also acts as an exfoliator, helping to smooth the rough skin. Because it’s a strong exfoliator, it may not be suitable for those with sensitive skin. It can be used daily by simply lathering soap with cloth and scrubbing it on your face or body. It leaves a subtle, but masculine fragrance. Lastly, clay component can make it slightly harder to wash off than usual. Soothing Pure Provance Soap is for those sensitive to all fragrances. This soap leaves a clean feeling, without using any parabens or sulfates. It’s made mostly out of organic ingredients such as shea butter and coconut oil. They’re manufactured with triple french mill technique to ensure a completely natural soap bar with a rich, creamy lather. The product can be used for both face and body, and it’s suitable for all skin types, even the most sensitive ones. It’s quite long lasting if you keep it dry after usage. Also, the paper wrap is recyclable. 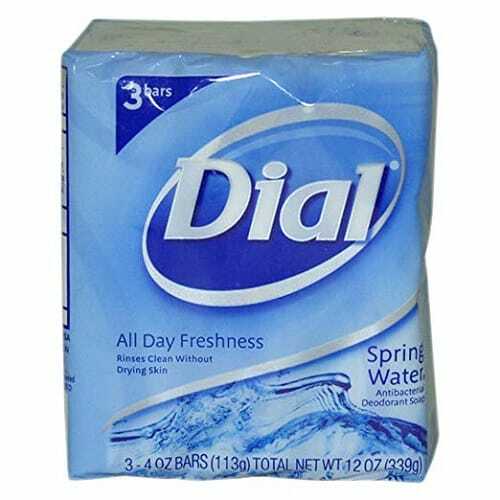 Dial is a simple, scentless soap that leaves a clean, fresh feeling throughout the day. It lathers up nicely without noticeable skin drying. What’s most impressive about this product are its antibacterial properties. It prevents breakouts caused by an everyday encounter with bacterias and bodily fluids. Since it’s an antibacterial product, it’s great for most skin types and can be used as both body and hand soap on an everyday basis. The product is hand-sized and curved for a more convenient fit. Lastly, for a low price, you will receive three soap bars in one package, with each bar individually packed. Only a handful of ingredients are used in making Splendor Santa Barbara Soap. These include coconut oil, cocoa butter, aloe juice, colloidal oats, organic chamomile and organic calendula. The item doesn’t contain parabens or palm oil. There are three bars per package and it arrives in sustainable packaging. All the ingredients put together relieve itching, soften the skin, gently clean and generally improve the appearance of the skin. It’s appropriate for every skin type, especially sensitive one. It dissolves relatively quick, but you can prevent that by not overusing it and using a draining soap dish. Also, it’s poorly cut, so it can be difficult to apply it for the first few times. Of course, it’s recommended to test it on a small skin area before actually using the product. For those suffering from eczema, psoriasis or dry, sensitive skin Southern Natural is the best way to soothe and renew the skin. Olive and coconut oil hydrate damaged skin, goat milk contains many vitamins and proteins and lavender oil has antibacterial and calming properties, along with a mild scent. It can be used as a regular body soap, shaving soap, hand soap and more. Since it’s so mild, it’s even suitable for babies. There are three 4 oz bars in the packaging which last about a month or two, depending on the usage. Also, make sure you properly store it because it easily disintegrates when wet. 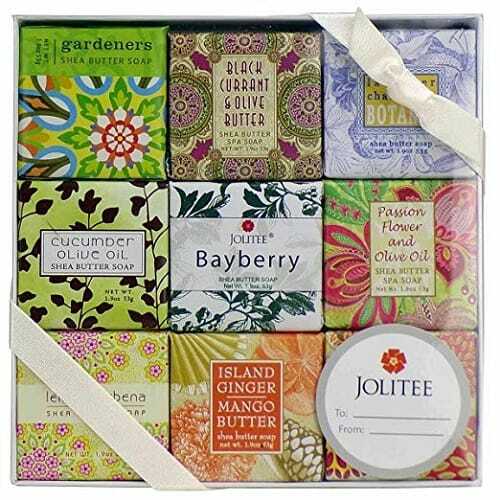 In the Jolitee Soap Set, you will receive nine wonderful scents, each one individually packed. Colorfully packed, this set makes an excellent gift for any occasion. Besides the vibrant look of these soap bars, they are all produced with french mill technique, which makes the soap smoother and without any impurities. They contain various natural and organic ingredients such as lavender, lemon, rose, violet, passion flower, orchid, jasmine and zinnia. Each scent has its benefit and they reduce stress, help with insomnia, lift depression and more. They are pretty small in size because each soap is only 1.9 oz. To conclude, these little aromatherapy soaps leave your skin gently cleansed and soft and make a perfect bath experience. Blend of natural ingredients in Marlowe lift away dirt and dry skin, without eliminating natural moisture. Passionflower moisturizes and restores skin glow, green tea extract protects from external stress and willow bar and deep sea algae extract soothe the irritated skin. You can control the level of exfoliation with this product by massaging the soap all over your body or lathering it in your hands, that applying. It leaves a light scent of agarwood mixed with sandalwood. If you store it away correctly, it can last up to a month or even more. Lastly, it might not be appropriate for sensitive skin as it contains rough exfoliating texture. All the pros and cons of this product are listed above, at number 2. 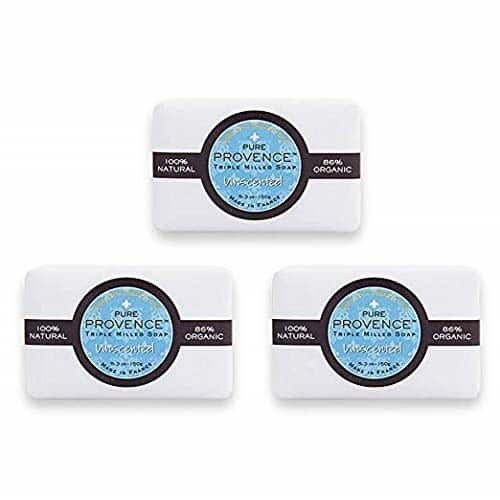 If you’re looking for the best unscented soap that also forms a rich lather and profoundly moisturizes and improves your skin, Pure Provance Bar Soap is the way to go. Check the complete review and best features of this product above, at number 11 to better decide whether it’ll work the best for your needs. Made with certified organic ingredients and no parabens, sulfates and synthetic fragrances The Yellow Bird maintains healthy skin glow. Being made by hand, in small batches, it gives control over the used ingredients. 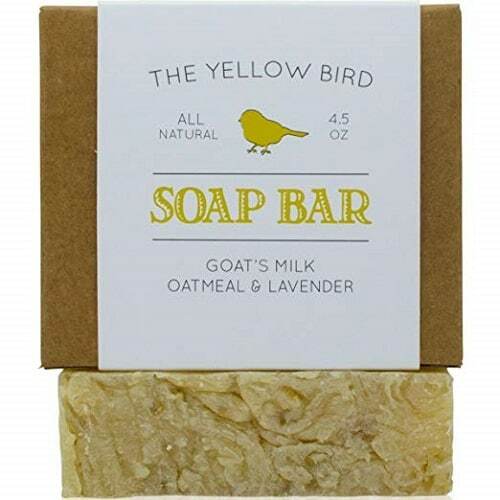 Goat milk and shea butter hydrate and brighten the skin and oats help with gentle exfoliation. It especially suitable for those who suffer from eczema and psoriasis, but it also has a significant effect on oily skin prone to acne. It’s recommended to cut it in more pieces since it’s quickly dissolved in contact with water. Also, it a bit high priced. It may sound silly to think this explanation is needed, but a lot of the reason why people dislike using bar soaps is because they aren’t doing it correctly. Before you even think about reaching for the soap, make sure you get good and wet. Use your hands to wipe away any large mess or debris; this also helps open your pores, which will help you get a thorough, deep clean. After the rinse, a lot of people make the mistake of just grabbing for the soap bar and rubbing it around willy-nilly. If you do this, you’ll never get a good lather going, and you’ll be shortchanging yourself from a total clean. Instead, try wetting the soap and working it into a lather against something slightly abrasive, like a loofah or washcloth. When you’re done, put the bar back and clean yourself with the cloth. This way, you also don’t have to worry about the soap slipping out of your hands. You might not give much thought to the order in which you wash, but it is best to start at the top of your body and then work your way down – both when washing and rinsing. This way, you can ensure a proper clean, but you also ensure a total rinse. The less residue left after washing, the better. People assume bar soaps don’t last very long because they don’t store them properly. Never leave it somewhere wet, like the side of your shower or tub. Instead, keep it somewhere dry like a soap dish to keep it from disintegrating. Photos from: Timmary / depositphotos.com, kitchbain / depositphotos.com, roger-scardigno / depositphotos.com, Subbotina / depositphotos.com, Anegada / depositphotos.com.